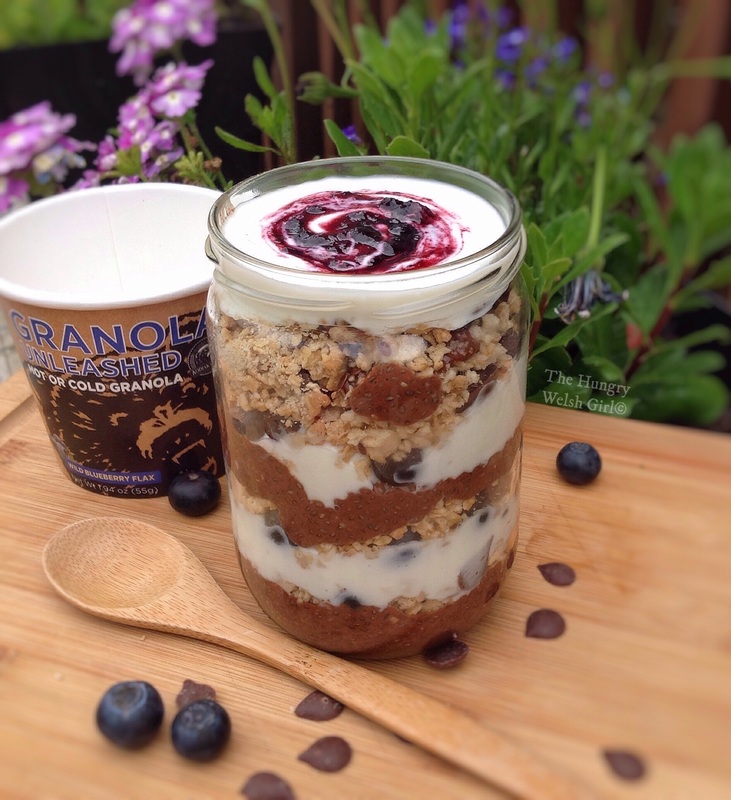 Review: Kodiak Cakes Blueberry Granola & Chia Parfait. Last week was quite humid, but overcast and I was in the mood for something summery to eat. Usually when I think of breakfast during the summer I think of yoghurt and berries with honey, but those three foods on their own won’t satisfy this hungry Welsh girl. After much deliberation, I came up with this; blueberry granola and chia parfait. A very nutritious breakfast indeed. The Blueberry flax granola was sent to me, amongst many other Kodiak Cakes goodies, from Cardiff Sports Nutrition, a few weeks ago and it wasn’t only the first time I was trying the product, but it was also the first time that I have ever tried granola and it was definitely a big thumbs up from me. It was delicious and since Kodiak Cakes are all natural products, this added an extra – je ne sais quoi – to my already healthy breakfast. There are a lot of steps to making the blueberry granola and chia parfait, but don’t let that deter you because trust me – it is worth it. Firstly, you will need to make the chia pudding so that the pudding and the base will have time to set before you can add the other ingredients. You will need to do this the night before you plan to eat it. Add the chia seeds, coconut milk, stevia, cacao powder and chocolate protein powder to a bowl and combine thoroughly. You can use an electric whisk to make life easier. Next add about 1/4 cup of the chia pudding to the bottom of an empty jar or bowl and set in the fridge overnight, along with the remaining chia pudding that you should still have. In the morning combine the yoghurt with the vanilla protein powder until smooth. I find that protein powders add an adequate sweetness to food, but if this isn’t sweet enough for you then feel free to add more stevia. Now you can layer your parfait. And then top it off with an optional swirl of blueberry jam. The Kodiak Cakes: Blueberry Flax Granola Unleashed – Are available to buy from Cardiff Sports Nutrition, they are £2.20 a tub and there is a choice of two delicious flavours: Blueberry Flax and French Vanilla Almond, which are both high in fibre and low in saturated fat. If you are going to be using the granola in parfaits or for toppings on porridge or yoghurt, then you can quite easily make two servings out of the tub, but obviously you can eat the granola on the go too, straight from the tub: Hot or cold. I also have a discount code you can use at the checkout at Cardiff Sports Nutrition, to save yourselves 10% on your order – Happy10. The code won’t work on already discounted products. For more recipes and reviews you can follow me on Instagram – @Happy.Hungry.Healthy – You can tag me in any recipes you try #TheHungryWelshGirl. Satay Quorn Chicken Kebabs, Wrapped in a Herb Power Wrap.